It's quite astonishing how quickly guilt can kick in for the smallest and most insignificant things in one's life. Guilt is an emotional warning sign that most of us learn through our childhood social development. Its main purpose is to let us know when we've done something incorrect, thus helping us to develop a better sense of our behaviour and how it affects ourselves and others. Learn to forgive yourself: If your feeling of guilt is haunting you, you should take some steps to stop this self-inflicted punishment. Firstly, list the things you feel guilty about. It could be something silly you said recently or an act of unkindness to a friend in your childhood or a personal habit that has damaged your relationship with a loved one. Go on to ask yourself, "How can I forgive myself and let it go?" You can have a talk, write a letter or commit to a personal change. Practice a no-guilt-rule when you're on vacation or just taking time out for yourself: Make it a point to tell yourself that you're taking a break and doing it for a reason, so there is no reason for you to feel guilty. If you hear yourself say "I should be..." immediately remind yourself why you have chosen not to do that. Fix things rather than feel guilty about it: For example, if you're feeling guilty because you went out with your friends on a weekend instead of visiting your folks, take time out from your schedule for a visit. Commit to saying no: Do this at least once a day- no guilt allowed. Focus on the present: Stop asking "What if?" instead, start asking "What now?" It's time to stop thinking about things that you've already done and cannot change. Focus on the present and do what you can today to make your life a little better. Don't blame yourself: Most people often blame themselves for anything that goes wrong, big or small. This is a bad approach, instead take a more forgiving approach to the world and identify that sometimes, things just happen on their own that cannot be blamed on any one person. Start a guilt journal: Each time you feel guilty about something, write it down in your guilt journal with the time and day. After a few weeks, read this journal to find the trends in your guilt, this will give you clues to the cause of your guilt which will enable you to better deal with its chief roots. 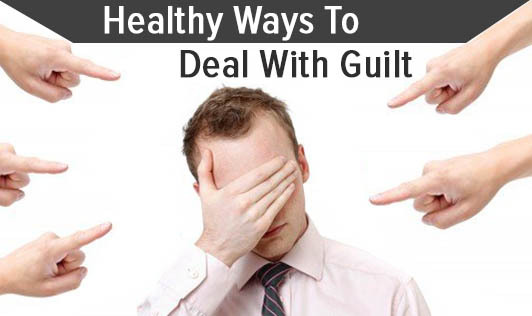 Keep in mind that guilt is one of those emotions that we feel is telling us something important. So,be aware that not every emotion, surely not every guilty feeling is a rational one that has a purpose. Remember to be sceptical the next time you feel guilty, whether it is trying to teach you something rational about your behaviour or is it just an emotional, unreasonable response to a situation? The answer to this question will be your initial step to helping yourself to be better prepared to cope with guilt in the future!